It is hard to imagine a physician who took the Hippocratic Oath more seriously than Dr. Evgeny Sergeevich Botkin, physician to the last Tsar Nicholas II. His devotion to Nicholas, Aleksandra and their children cost him his marriage and eventually his life. Despite his enormous sacrifice, little has been written about him. Anyone acquainted with the facts of his life and the details of his service to the Imperial family must consider his efforts heroic. Dr. Botkin was born in St. Petersburg in Russia in 1865. His father, Dr. Sergey Petrovich Botkin (1832-1889), who served as physician to both Aleksander II and Aleksander III, is considered the father of Russian medicine. While studying at the Academy of Medicine, he suffered temporary expulsion for his spirited defence of fellow students who had run afoul of the college administration. As one of five elders elected by his class, he sent a petition to Aleksander III defending the students. Although the Tsar was moved by the sentiments expressed, he could not grant a petition from students and the elders were expelled. It was not uncommon for ‘trouble makers’ from good families who could not be openly arrested to simply disappear at the hands of the secret police. S.P. Botkin knew that even his prominent status as a physician to Aleksander III could not guarantee his son’s safety. He urged Evgeny to maintain a low profile and to avoid going out alone at night. The five young men met for dinner on the day of their expulsion and vowed to meet annually on that date. All five were soon readmitted to the Academy. True to their word, the elders met every year to dine together and have a group portrait taken. If a member was deceased, the others would include a photograph of him in the group portrait. Botkin attended every gathering from 1889 through 1916. Upon graduation from the Academy of Medicine in 1889, Dr. Botkin was offered the post of physician to Tsarevich George Aleksandrovich, which he declined, preferring to continue his studies in Berlin and Heidelberg. After returning to Russia, Botkin lived in near poverty. 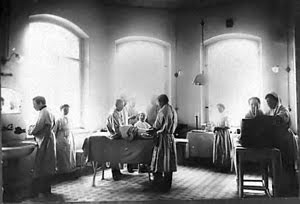 At that time it was difficult for physicians to make a decent living in Russia since they were not permitted to bill patients for services but were expected to care for anyone requiring medical treatment regardless of the patient’s ability to pay. Later he became a lecturer at the Academy of Medicine and was appointed Chief Physician at St. George’s Hospital, a position which provided a modest income for his wife Olga and for their children Dmitry, George, Tatiana and Gleb. 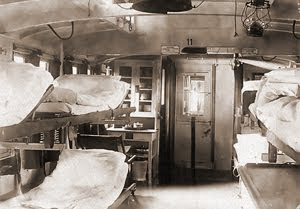 During the Russian-Japanese war of 1904-1905, Dr. Botkin served as a volunteer at the front aboard the St. George’s Hospital train. He was later awarded the Grand Cordon of the Order of St. Anna for his distinguished war time service and appointed Chief Commissioner of the Russian Red Cross. Tsarevich Aleksey was seen by Dr. Vladimir Derevenko, who was hired by Botkin as an assistant. His calm and personable manner made Dr. Botkin the perfect physician for the Tsarina, who had definite ideas about her ailments and did not like to be contradicted. Her symptoms convinced Aleksandra that she had a heart condition, although Botkin believed her symptoms were due to a ‘nervous condition’ brought on by stress and anxiety. He usually visited her twice a day at 9 a.m. and again at 5 p.m. Botkin often conversed with Aleksandra in her native German and due to his fluency in foreign languages, he sometimes served as an interpreter when she received foreign visitors. Members of the imperial family and most members of their household liked and respected Dr. Botkin. The Imperial children were especially fond of him and made him an unwitting partner in one of their games: “A tall stout man who wore blue suits with a gold watch chain across his stomach, he exuded a strong perfume imported from Paris. When they were free, the young Grand Duchesses liked to track him from room to room, following his trail by sniffing his scent”. Lili Dehn, lady-in-waiting to Aleksandra, described him as “a clever, liberal-minded man” whose “political views were opposed to those of the Imperialists” but whose devotion to the Tsar made these differences seem unimportant. Some courtiers believed that Dr. Botkin told Aleksandra only what she wanted to hear and that he coddled her, thereby enabling her to avoid her official duties. Others distrusted him because he was on friendly terms with Anna Vyrubova, although their relationship rapidly deteriorated when he refused to befriend Rasputin. Dr. Botkin’s days were devoted to the care of the imperial family. At night, he kept up with his students from the Academy of Medicine, fulfilled his obligations to the medical societies to which he belonged and pursued his philanthropic interests. The demands of his position and the devotion with which he performed his duties eventually cost him his marriage. His wife and children accompanied him on the Imperial trip to the Crimea in the fall of 1909, but Olga saw so little of him that she left after three weeks. In 1910, she had an affair with their children’s German tutor, Friederich Lichinger, whom she later married. Botkin reluctantly agreed to a divorce and retained custody of their children. Olga died in Berlin during the collapse of the Third Reich. Gleb and his sister Tatiana met the Tsarevich and young grand duchesses for the first time in person at Livadia that fall and were often invited to the palace to play. It was at Livadia that the Imperial children were introduced to Gleb’s stories and drawings about an imaginary planet of toy animals led by a tsar bear. Years later during their Siberian exile, Gleb continued to amuse the Imperial children with these stories. The outbreak of World War I in August of 1914 found all of the Botkins involved in the war effort. The Tsarina sent Dr. Botkin to Yalta and Livadia to establish hospitals, his elder sons Dmitry and George were at the front, and Tatiana volunteered as a nurse at the Catherine Palace Hospital. 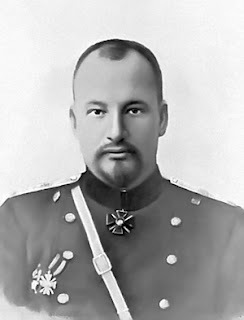 That December, Dmitry, a lieutenant in the Cossack regiment on the eastern front, was killed in action. Dr. Botkin never faltered in his commitment to relieve physical suffering but after 1914, he lived an increasingly spiritual life and concerned himself with the health of his patients’ souls as well as that of their bodies. It was his spiritual commitment which gave him the strength to endure exile. George, a volunteer with the Fourth Rifles of the Imperial Family, was seriously wounded but survived the war. He was imprisoned and shot by the Nazis during World War II. When the revolution broke out in St. Petersburg in March of 1917, the Provisional Government placed the Tsarina and her children under house arrest. Botkin stayed with them. Botkin helped Aleksandra through the abdication of Nicholas on March 15, and the Tsar’s return to Tsarskoe Selo on March 22. He lived under house arrest at the Aleksander Palace with the Imperial family from March until August, accompanying the family and their servants into exile at Tobolsk in north-western Siberia. Gleb and Tatiana were allowed to accompany their father and all three lived together in two rooms of Kornilov House across the street from the former Governor’s Mansion where the Imperial family was confined. Dr. Botkin unsuccessfully attempted to convince Aleksander Kerensky, President of the Provisional Government, that instead of Siberian exile, Aleksandra and her children should be sent to the Crimea for health reasons. In Tobolsk he argued for better food and more comfortable conditions for the prisoners and complained to the Commandant about the rude treatment the family received from their guards. His request that the family be permitted to spend one hour a day walking in the garden was granted, but permission was refused for Aleksandra and Aleksey to sit on the balcony when they were too ill to walk. Even gaining permission for the family to open a window during the sweltering summer evenings was a battle. The Imperial servants were permitted to go for walks in town but forbidden to enter the homes of private citizens. Dr. Botkin and Dr. Derevenko were the exceptions since the shortage of doctors meant that their services were needed by local residents. The fact that he was able to continue his work as a physician and had his children near him made exile easier for him to bear. Nicholas, Aleksandra and members of their retinue divided up responsibility for the children’s education. Dr. Botkin tutored them in Russian. During this period Gleb continued to create stories and drawings for the Imperial children about his toy animals and added to the plot the story of a revolution and a monarch’s struggle to regain his throne. On April 26, 1918, Dr. Botkin left Tobolsk with Nicholas, Aleksandra, Grand Duchess Marie and other members of the household. Believing they were bound for England via Moscow, Botkin left a letter for his children assuring them that they would join him in England. Commissar Yakovlev told them that Nicholas would be tried in Moscow and sentenced to deportation along with his family. The others stayed behind with Aleksey who was recovering from a fall and was too ill to travel. When the party arrived in Tyumen on April 29, Botkin was suffering from liver colic brought on by many hours of travel over bad roads. On May 3, 1918, the Imperial household had been sent to live at Ipatiev House in Ekaterinburg. During the seventy-eight days of confinement in Ipatiev House, Dr. Botkin often spent his evenings with Nicholas and Aleksandra. They passed the time together talking, playing cards and listening to Nicholas read aloud. Botkin often spent the night sleeping in Aleksey’s room. On June 23, Dr. Botkin suffered a recurrence of colic severe enough to require a morphine injection and was ill for five days. Aleksandra sat with him for much of that time. In the early morning hours of July 17, 1918, Botkin was awakened by Commandant Yurovsky and told to inform the prisoners that the White Army was approaching and that they must be moved to the basement for their own protection. Forty minutes later, Dr. Botkin was murdered by a firing squad along with the Imperial family and the remaining members of their household. Botkin was shot twice in the abdomen; one bullet hit his lumbar vertebrae and the other his pelvis. A third bullet hit his legs breaking his kneecaps and legs. He was also shot in the forehead. 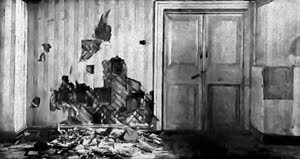 The whole Imperial family were killed on the night of July 17, 1918, in the cellar of Ipatiev House". In 1981, along with Nicholas, Aleksandra, their children and servants, Dr. Botkin was canonized a martyr by the Russian Orthodox Church outside Russia. On July 17 1998, the eightieth anniversary of his death, Dr. Botkin’s remains were buried with those of the Imperial family and their servants in the Catherine Chapel in the cathedral of the Fortress of St. Peter and St. Paul. His granddaughter, Marina Botkina Schweitzer, attended the funeral with her son Constantine. Along with the Imperial family and those who were murdered with them, Dr. Botkin was canonized a ‘passion bearer’ (one who met death with Christian humility) by the Russian Orthodox Church on August 19-20, 2000 at the Cathedral of Christ the Saviour in Moscow. I must thank you for this marvelous article about this wonderful man. My name is Charles e Dean II, grandson of Marina botkin, great grandson of Glen botkin. Anyone who can please connect me to my family's history please call or email me immediately. I have long felt I was in the dark as to our history and missing something of myself.